If I may quote The Matrix Reloaded for a moment: "It is purpose that connects us, that pulls us, that guides us. It is purpose that defines us." Purpose is one of the larger struggles in bringing old dinosaurs back into operation. Most people lack purpose for these old 'puters. The trick is finding something for them to mull over or do nothing at all (I'll explain the latter later on). Extending the life of an old machine can sometimes require the user to jump through certain hoops during preparation. As I outlined in Calculating the Usefulness Equation, there is an easy way to figure out a machine's destiny. As far as Old World Macs (pre-G3 models) go, I highly recommend hot rodding, which does add to the cost of preparation for use. There are G3 and G4 upgrades for almost every PCI Power Mac in existence, not to mention '040 upgrades for 68030 models. My favorite task to allocate to an older machine is running a tiny version of Linux along with a web server. It's the ultimate proof of concept for repurposing a machine. It proves that the machine can still be used in this day and age. There is also a great purpose for Old World Macs that have ethernet and LocalTalk: a LocalTalk bridge for your non-ethernet Macs. This is a particular purpose that can be run in the background on more powerful Macs, or in the foreground on not-so-powerful ones. You should avoid any Old World Mac that will cost more to get running then it's final product will be worth. If you're spending $400 to get a 40 MHz Mac IIfx machine in running condition, you had better have a good reason. For example, hot rodding my Power Mac 8600 only cost me $125. It's running a 400 MHz G3 upgrade ($20), 512 MB of RAM ($25), dual 10 GB SCSI drives ($50), and the computer itself cost $20 at a garage sale. It is a great web server (not to mention almost full featured) and mention a powerful OS 9 machine. The equation is definitely balanced. This brings me to my next point: The exception to the Cost to Purpose calculation is Mac museums and collections. In the Old World category, there are many rare and awesome machines that may not have any true power behind them, but they look great on display because of their rarity or interesting design. 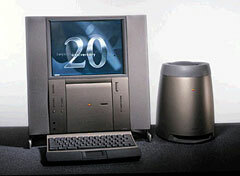 The Twentieth Anniversary Mac and Macintosh TV are good examples. My personal preference when searching for Old World project computers is to focus on expandability. The more I can put into it to improve function, the happier I will be with the finished product. This will vary from person to person, depending on the final goal of the project. My best advice: if you see a dump-bound Mac, take a gander inside and give it another chance. You might just be surprised. Next time we'll visit hardware and upgrade compatibility concepts you should keep in mind.